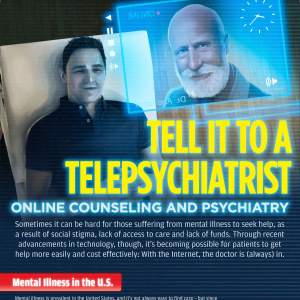 Mental illness is prevalent in the United States, and it’s not always easy to find care – but since Internet access is widespread, online therapy and telepsychiatry can help change that. What Is Telepsychiatry and Online Therapy? Online therapists generally contract with web-based companies that allow patients to contact the provider directly. 7Cups.com pairs users with active listeners, either through their peers – meaning other users just like them who are trained to listen – for free, or with licensed therapists, for a per-minute fee.